A new NASA-sponsored study shows that global methane emissions produced by livestock are 11 percent higher than estimates made last decade. Because methane is a particularly nasty greenhouse gas, the new finding means it’s going to be even tougher to combat climate change than we realized. We’ve known for quite some time that greenhouse gases produced by cattle, sheep, and pigs are a significant contributor to global warming, but the new research, published in Carbon Balance and Management, shows it’s worse than we thought. Revised figures of methane produced by livestock in 2011 were 11 percent higher than estimates made in 2006 by the Intergovernmental Panel on Climate Change (IPCC)—a now out-of-date estimate. It’s hard to believe that belches, farts, and poop from livestock could have any kind of global atmospheric effect, but it’s an issue of scale, and the nature of methane itself. There are approximately 1.5 billion cows on the planet, each and every one of them expelling upwards of 30 to 50 gallons of methane each day. We typically think of farts as being the culprit, but belches are actually the primary source of cattle-produced methane, accounting for 95 percent of the problematic greenhouse gas. Do Cow Farts Actually Contribute to Global Warming? And problematic it is. Methane is about 30 times more efficient at trapping the Sun’s radiative heat than carbon dioxide over a timescale of about a century. There may be more CO2 in the atmosphere than methane, but by unit, it’s the more destructive greenhouse gas. Both NASA’s Carbon Monitoring System research initiative and the Joint Global Change Research Institute (JGCRI) contributed to the study. Wolf’s team re-evaluated the data used to produce the IPCC 2006 methane emissions estimates. The prior estimates were based on relatively modest rates of methane increases from 2000 to 2006, but things changed dramatically afterwards, increasing 10-fold over the course of the next 10 years. 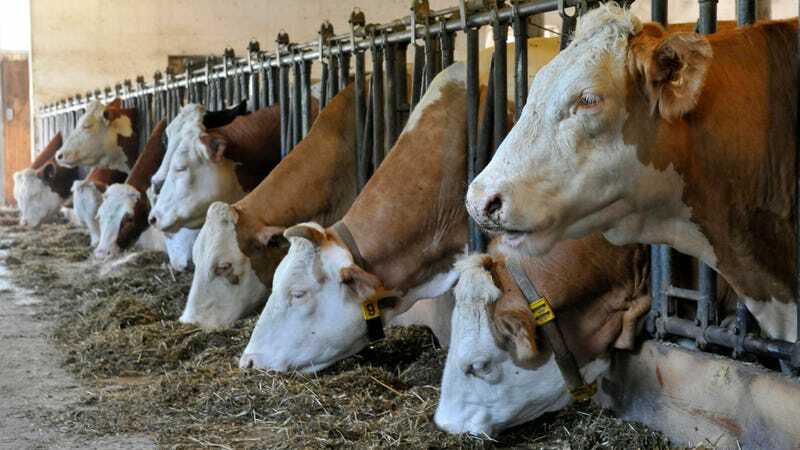 The new figures factor an 8.4 percent increase in methane emissions from digestion (otherwise known as “enteric fermentation”) in dairy cows and other cattle, and a 36.7 percent increase in methane from manure, compared to previous IPCC-based estimates. The new report shows that methane accounted for approximately 16 percent of global greenhouse gas emissions in 2016. Other human activities, such as the production and transport of gas, oil and coal, along with the decay of our organic waste, also contribute to global methane emissions. Importantly, the new estimates are 15 percent higher than global estimates produced by the US Environmental Protection Agency (EPA), and four percent higher than EDGAR (Emissions Database for Global Atmospheric Research). The new research shows that methane emissions slowed in the US, Canada, and Europe, but they’re rising elsewhere. Very likely, the rest of the world is catching up to first-world standards in terms of meat and dairy consumption. It’s not immediately clear how, or even if, these revised figures will impact livestock production or public policy, but at the individual level, it suggests we should cut back on our consumption of meat and dairy. The privilege we have over these animals, it would appear, now comes at a hefty price. Update: An earlier version of this article included a statement suggesting that methane will exert a global warming potential 28 times greater than that of CO2 over then next 100 years. While methane has a unit for unit GWP that’s about 30 times that of CO2 on 100 year timescales, CO2 is still the dominant greenhosue gas in our atmosphere because there is so much more of it. The sentence in question has been removed.